The Toyota Innova Crysta Lounge modification makes the high-selling MPV look as luxurious as a luxury vehicle! The Toyota Innova Crysta defies all logic. In a country where MPVs are considered boring and are most often less favoured than a sedan or a SUV, the second-gen Innova enjoys amazing popularity. The Crysta is already a pretty premium vehicle that offers a great build, fantastic engines, enough features, and an excellent ride quality. However, the modified Toyota Innova Crysta Lounge from Executive Modcar Trends has made the MPV as plush as a luxury car. The modified Toyota Innova Crysta Lounge retains the front seats but the second and the third row has been replaced with two large-size electric reclines that take the passenger comfort to the next level. Also, the occupants enjoy features like a privacy partition, refrigeration that can keep the drinks chilled, and touch-sensitive controls for the aircon as well as the infotainment system. 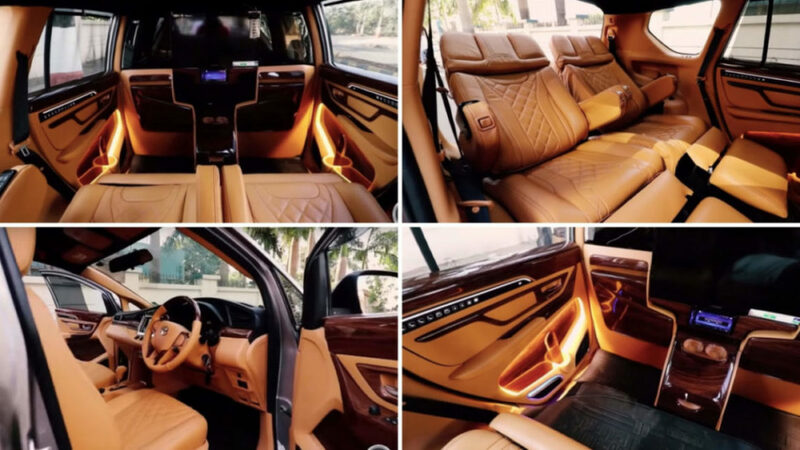 The interior of the modified Toyota Innova Crysta is draped in rich leather. Even the door panels have been updated to look more upmarket and match the high-class theme of the cabin. The passengers in the rear even get electrically foldable tables that can be operated through touch controls. There’s even a 24-inch TV and ambient lighting to make things even better. The rear passengers get a limo-like 40-inch of legroom. The roofline is flanked with star-glazed LED lights and cup holders near the chiller. There is even an intercom system that enables the rear passengers to communicate with the chauffeur. These features are sure to have resulted in a great experience for anyone who has sat in the rear seats of this modified Toyota Innova Crysta. Even the front section of the interior of this modified Toyota Innova Crysta receives some modifications. The customizers have equipped the front of the cabin with a half-wood steering wheel, Nappa leather seat upholstery, wood trim on the dashboard, and ambient lighting. Other features of this modified Toyota Innova Crysta include an inverter, new carpets, and DVD system. Details of the specifications aren’t available at the moment but it looks like the original engine has been left untouched.